It is said that every American who was alive in 1963 remembers exactly what he or she was doing at the moment they heard the news of President Kennedy being shot. Then, less than an hour later, came the awful report that he had died. It’s hard for anyone who was not a witness to those sad days to fully comprehend the sense of loss which overtook the nation. This grief found expression in the renaming of many civic structures, roadways and even geographical features in honor of the slain leader. 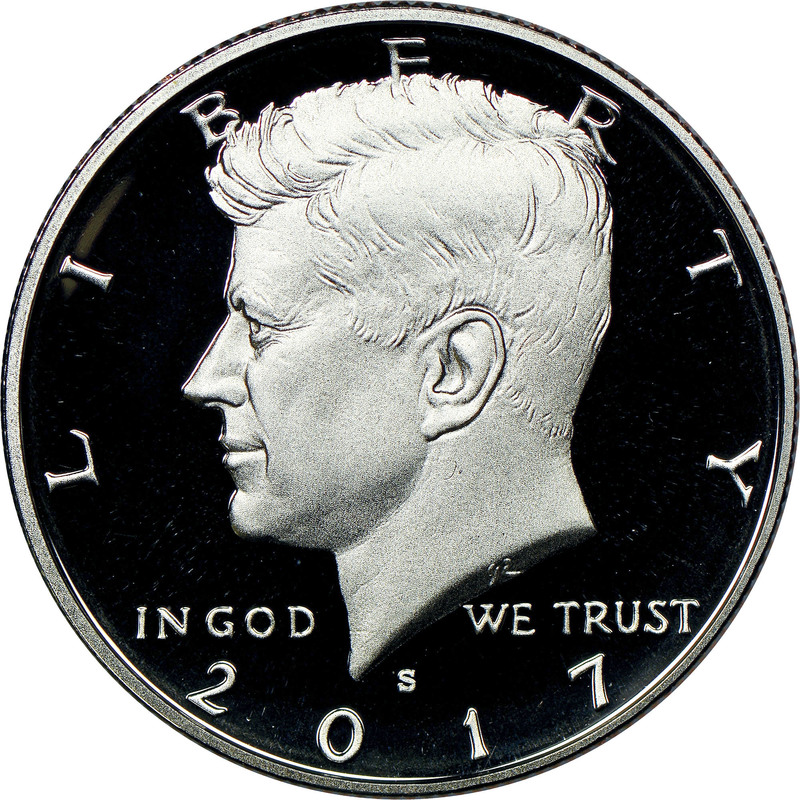 Of all these memorials, however, the United States half dollar bearing Kennedy’s familiar likeness will almost certainly survive the longest, since coins, being nearly indestructible, have a long track record as the most durable witnesses to history. “Shortly after the tragedy of President Kennedy’s death, November 22, 1963, Miss Eva Adams, the Director of the Mint, telephoned me at the Philadelphia Mint and explained that serious consideration was being given to placing President Kennedy’s portrait on a new design U.S. silver coin and that the quarter dollar, half dollar or the one dollar were under discussion. This work was undertaken immediately, Gilroy Roberts sculpting the portrait obverse, while his longtime Assistant Engraver, Frank Gasparro, prepared the reverse model bearing the presidential seal. Both were amply experienced in these tasks. Along with the sculpting of various mint medals, Roberts had prepared the models of John R. Sinnock’s design for the Benjamin Franklin half dollar of 1948, following Sinnock’s death the previous year. Gasparro too was a veteran of numerous medal designs, and he had most recently created the new reverse which debuted on the Lincoln cent in 1959. For these two artists, time was of the essence, as the new year loomed ahead, and the Treasury Department did not want to issue any of the existing-type Franklin half dollars dated 1964. Complicating matters still further was a severe, nationwide shortage of all coins. Half dollars of one type or the other had to be ready for coining early in the new year to avert a worsening of this shortage. In the meantime, however, there was a legal hurdle to overcome: Under existing law, U. S. coin designs could not be changed more often than every 25 years; the Franklin half was then only 15 years old, and its replacement would quite literally require an act of Congress. 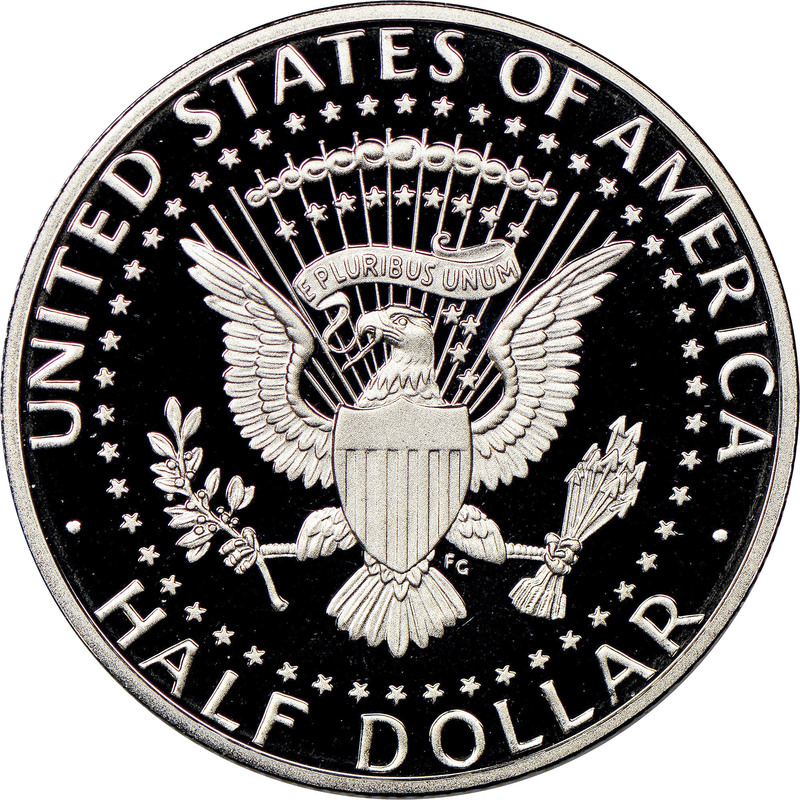 Partisan disputes were largely set aside in recognition of the nation’s and the world’s loss, and Congress managed to pass legislation permitting a change in the half dollar’s design with only a few weeks’ debate. The Act of December 30, 1963 made the Kennedy half dollar a reality. Using his existing models for JFK’s presidential medal as a guide, Roberts completed his initial rendering of the half dollar within days of its commissioning. Gasparro, too, worked feverishly, and trial strikes of the Kennedy half were run off and dispatched to Mint Director Adams on December 13. A few days later, these were viewed by the President’s widow, Jacqueline, and brother, U. S. Attorney General Robert F. Kennedy. Incorporating some of Mrs. Kennedy’s comments into his revised models, Roberts had additional trial strikes coined. These were viewed and approved by Treasury Secretary Douglas Dillon, who agreed that Mrs. Kennedy’s wishes had been met. The first Kennedy half dollars made for distribution were proofs coined early in 1964. By January 30, regular-issue coinage began at the Denver Mint, and the Philadelphia Mint followed suit the week after. These coins were released to the public amid much fanfare and anticipation on March 24, 1964. Despite limiting the number of coins they would sell to each individual, banks were quickly denuded of their supplies; few of the coins ever achieved actual circulation. From its very inception, the Kennedy half dollar became a keepsake, one cherished not only by Americans but by the late President’s many foreign admirers, as well. The number of Kennedy halves produced during 1964 was enormous in comparison to previous half dollar mintages. Despite this, the coins continued to disappear as fast as they were issued. With the nationwide shortage of all coins showing no let-up, Congress enacted a law which permitted freezing the 1964 date on U. S. coins until such time as the crisis passed. This was done in an effort to discourage hoarding by collectors and speculators, but the real problem lay in methods of distribution and recirculation, rather than being caused by the insignificant actions of hobbyists. When Congress opted to eliminate silver from the dime and quarter beginning in 1965, it reached a compromise with the half dollar: Its silver content, while greatly reduced overall, was placed almost entirely at the coin’s surface by bonding three strips of metal, the innermost one being primarily copper. These “silver-clad” pieces were coined from 1965 through 1970. Despite these various steps, Kennedy half dollars still failed to circulate to any great extent, and the question of eliminating its silver content altogether was eventually raised. After protracted debate during 1969-70, a bill was finally passed near the end of 1970 which called for the coining of half dollars in the same composition used since 1965 for the dime and quarter: two outer layers of copper and nickel bonded to an inner core of pure copper. From 1971 onward, the Kennedy half dollar would bear the red edge which had already become familiar to Americans who mourned the passing of silver from the nation’s coinage. Alas, even this concession was not enough to make half dollars reappear in circulation, and today they are known only to coin collectors. For the nation’s bicentennial in 1976, a special reverse was prepared by Seth G. Huntington which depicted Philadelphia’s Independence Hall, birthplace of the United States. Huntington’s design had been selected from among numerous entries in a 1973 competition. Bicentennial halves bearing the dual dates 1776-1976 were coined during 1975 and 1976 in both copper-nickel-clad and silver-clad compositions. The latter were not released to circulation, but rather were sold at a premium to collectors in both uncirculated and proof editions. There are no rare date/mint combinations in the Kennedy half dollar series, although some pieces saw limited distribution. Proofs were coined for collectors in 1964 at the Philadelphia Mint and since 1968 at the San Francisco Mint. So-called “special mint set” coins were offered in place of true proofs during 1965-67, and these are usually collected in conjunction with the proof sets. The 1970-D half dollars were struck only to fill that year’s orders for mint sets, pending the change to copper-nickel coinage; the silver-clad, bicentennial halves were likewise coined only for collectors. In 1987, the Mint announced that no half dollars of that date would be issued for circulation, and this caused a surge in the number of mint sets ordered. Since 2002, production of "circulating" half dollars has been limited to the number needed to fill orders from collectors, confirming this denomination's status as an obsolete component of our currency. Finally, since 1992, the Mint has offered proof sets of both the conventional copper-nickel coinage and ones in which the dime, quarter and half are .900 fine silver, the composition used in 1964 and earlier years. These have proved popular with collectors, though they are as anachronistic as the half dollar denomination itself.